Engagement is a special time in every woman’s life, but celebrities do get to receive a preferential treatment when it comes to receiving engagement rings from their boyfriends. Read on to find out which are the most expensive engagement rings received by celebrities are and how much they are worth. An engagement ring that “breaks the ice” is the one offered by the soloist and actress Jessica Simpson received from her husband, Eric Johnson. Yellow gold with an oval sapphire and a diamond encrusted in the middle make Jessica’s engagement ring one of the truly special ones on the planet. A model of engagement ring that is “different” among all the rings in white gold with diamonds. Halle, Olivier Martinez received a white gold ring with an emerald and other smaller diamonds. The ring itself is made ​​of pure gold processed according to the old traditions of the people of Phoenician and encrusted with its symbols. In fact, it is a secret message known only by the two lovers. Perhaps you were expecting to meet Angelina ranking somewhere below. But do not forget, the Brangelina couple has always wanted to show discretion and modesty. Amazing elegance and finesse, the engagement ring Brad offered to Angelina is created by a jeweler in Beverly Hills. At the time of his engagement to Michael Douglas Catherine Rumor actor and made a small hole in the budget to demonstrate love for his beautiful wife. We would say it was worth the effort, because the ring contains 29 authentic diamonds embedded inside. Jennifer Lopez could create her own series of engagement rings but at this time she only considers the ring received from actor Ben Affleck, which lived quiet and happy for years with actress Jennifer Garner. Here’s an engagement ring that most likely leave you dumbfounded due to design at first and then due to the price. Emerald and diamonds perfectly complement the discreet gold ring and form an example of elegance and romance which made ​​history. A funny coincidence – engagement rings Kim Kardashian’s and Paris Hilton looks strikingly, the two stars have a similar trajectory of celebrity and Paris’s ring is twice as expensive. The even funnier, if not ridiculous fact, is that Kim’s marriage with Kris Humphries only lasted for 75 days and Kim chose to not give up on the ring. From a top of the most expensive engagement rings could not miss Melania Knauss, the third wife of Donald Trump. Although not the most expensive ring ladies new Trump seems to be the most famous because it is made ​​with some of the clearest and precious diamonds – Graff diamonds. Being more controversial rather than famous, Paris Hilton is also known for the expensive things she uses as to buy as well as for the one which she receives as a gift. Her boyfriend, Paris Latsis, offered her a white gold ring encrusted with 24-carat diamonds when he asked for her hand. Rapper Jay Z does not miss any opportunity to indulge his wife with gifts and travel of millions of dollars. The ring which Jay Z “stole” Beyonce a YES makes no exception – it costs $ 5,000,000 and it comes from one of the most renowned jewelry artists. More specifically, it is a ring of 20 karat white gold, garnished with 18-carat diamonds. 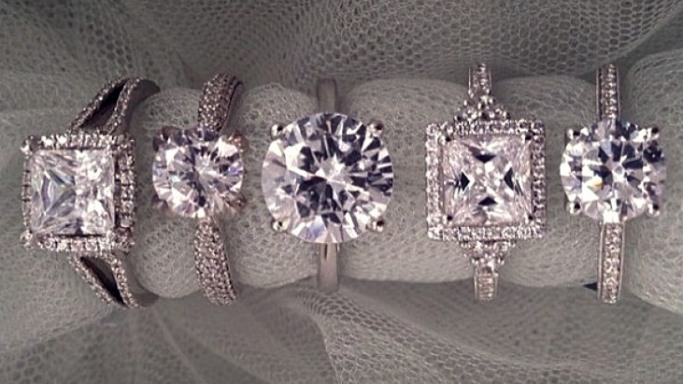 Which of these rings do you believe it is most fabulous?